An Apple a Day Keeps the Doctor Away - Really? Where does this saying come from? Where did this saying originate? Why do we never hear the cliché, "an orange a day keeps the doctor away?" When I was a child, I remember hearing this phrase many times. 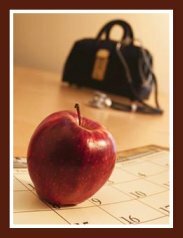 As far as I can recall, I believe it was always repeated at a time when I was choosing not to eat the apple which had wisely been packed inside my lunch bag, or offered to me at snack time. Of course the idea behind this cliché is that it is very important to maintain healthy bodies, by including fruit, such as apples in our diet every day. A similar proverb is: "Eat an apple on going to bed, And you'll keep the doctor from earning his bread". It is believed that this proverb originates from Pembrokeshire (Wales). Apples, in particular, are health boosters, in that, while different types of fruit have certain health benefits, apples have many proven nutritional health values all in one fruit! And, eating an apple, or including it in a packed lunch is easy, fast (needs no preparation), simple (does not need refrigeration), and tasty, making it more readily a choice of fruit in many households in the world. Some sources claim that, in order to receive the full health benefits of eating apples, they should be eaten with the peel still attached. Though the flesh of the apple contains antioxidant compounds, it is believed that the skin contains the bulk of the antioxidants. It has also been discovered, that different varieties of apples contain varying amounts of antioxidants. So, the next time you are tempted to pass over that juicy, crisp apple offered to you, remember, the principle of "an apple a day keeps the doctor away", is something worth considering! I also need to add, that, had I been offered an apple with dip, I would have not hesitated to eat it right away! Who can resist apples with apple dip?